Our next big camping adventure is a few weeks away and we await a call that our body repair parts are in and ready to install (I think this one will be a while). We just spent the weekend with family in Nashville, enjoying the Tomato Arts Festival, then swimming and paddleboarding in Percy Priest Reservoir. Our friends are all busy back at school (gosh it is nice to have morning coffee on the deck and read the paper). Now might be a good time to tell the tale of a good deed gone slightly awry this summer, plus a few things learned along the way. While we were camping in St. Augustine at Anastasia State Park, we spent the days on the beach or bobbing in the surf. If you have never been to that beach, let me clue you in a bit: it is wide as heck and quite the trek from car to water’s edge, “the desert.” You had to be sure you had something on your feet, because halfway to the water you would realize your feet were burning. Anyway, we would make the trek across this desert in the morning, our beach cart loaded with chairs and provisions, and set our chairs at water’s edge to relax and enjoy. 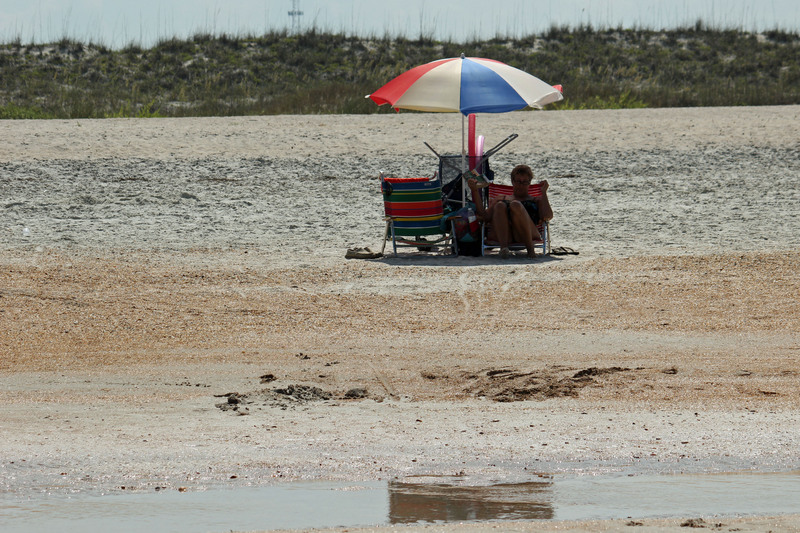 As we were sitting and sipping one afternoon, we noticed a beach wheelchair in the shallow water at low tide, empty. We made a couple of snarky remarks about how strange it was that nobody seemed to be concerned about an empty wheelchair at the edge of the surf and such. Next day we noticed the same wheelchair and the picture became clearer. Grandma was sitting in a beach chair beside the wheelchair, helped there by her daughter. Nice day at the beach. At the end of the afternoon, as most everyone was packing up and heading out across the desert in search of the parking lot, I saw that grandma was in the wheelchair near the guard stand and her daughter was loaded up with chairs, umbrellas, towels and bags getting ready to make the march across the sand. “I’ll be right back for you, Mom,” she said as she set off. Grandma was faced into the sun and looked like it had indeed been a long day in the sun. It really was a loooong walk across the sand. I felt I couldn’t just watch this play out and not do something, as grandma must have suffered a stroke recently and was so dependent on her daughter for mobility. I popped up, declared to the guards that I was not in fact stealing grandma, but helping return her to the car that lay on the other side of the Sahara there. So began my good deed, as I tried to chat up grandma and put her at ease. I shared that my mother-in-law had also suffered a stroke and it was a tough recovery. As I pushed and pushed, I heard her mumble and point to her left side and arm. I assumed she was trying to share that her left arm had been affected, as I continued to heave and push the wheelchair through the soft sand. Yes, it is a wide beach! Maybe halfway across the expanse I thought that I shouldn’t complain about my Tommy Bahama beach cart, because pushing this wheelchair was a REAL effort (and why was I huffing and puffing so bad?). I mean, you have these big balloon tires and all and grandma really wasn’t that big a woman, but gosh you really had to dig down and lean into it to move across the sand. At last we made it to the boardwalk and sidewalk and we moved along to the outdoor showers. “Arghhhh,” I growled, “no wonder it was so hard to push through the sand.” And come to think of it, grandma WAS trying to tell me something about the left side of the chair, if I had been paying attention. Ok, so we all had a good laugh and chuckled about how no good deed goes unpunished. “But we forgot your water bottle, Mom.” Just then, as it happened, a little girl arrived from the beach with the bottle and a towel and said “I saw you left these behind so I brought them to you.” How nice, another good deed. “But that’s not our towel.” “No problem,” I chirped. “I’m headed back across the sand anyway.” So back I went across the hot sand to return the towel to the young lady by the lifeguard stand who was wondering where her towel had disappeared to. “It was nothing,” I said, and then quickly splashed my way into the waves to recover from what really WAS something. I did feel better for having helped out, tempered by the thought that I still had to pack up the Tommy Bahama beach cart for one more trudge across the desert. Unless you want to listen to the piercing, beeping reminder that your leveling jacks are not fully retracted, take time to spray and wipe them with a dry lubricant while they are extended and before you pull up stakes. Chigger bites do indeed itch for about 2 weeks and there isn’t much you can do about them. Charge a spare camera battery and bring it with you on a photo hike. Strong sun can overheat your cell phone and make it shut down. I think that might also have been the problem with my 35mm digital camera. The dry, clean camp shower stall is the one with the worst water pressure. You CAN survive a tire blowout in 95 degree heat if you have good insurance. A countertop ice maker really can come in handy! Next up is our trip to Myrtle Beach just after labor day (using a time-share week) and then we begin preparations to leave for the West.